Everest was too young to appreciate the view when we visited the Eiffel tower. These days though, the kids reliably love watching transportation move along a street when we're up high - so when I look a this picture, I imagine how much they would enjoy watching the boats chug along the Seine. Theodora (Travels with a Nine Year Old) on September 3, 2010 at 2:07 a.m. I love watching river traffic from above, too. Even though I'm scared of heights. Go figure..
kerry on September 3, 2010 at 3:52 a.m.
Sophie on September 3, 2010 at 4:19 a.m. 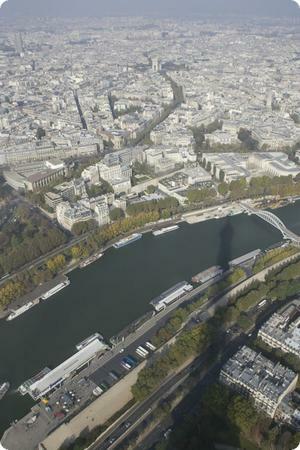 Cool how the Eiffel Tower casts its distinct shadow across the Seine. soultravelers3 on September 3, 2010 at 5:32 a.m.
Fab photo! We just left Paris after almost a month there & the Eiffel Tour is such a wonderful icon for kids of all ages. We parked our RV a few feet from the Seine in Paris and kidlet loved feeding the ducks and swans every morning at breakfast & watching the barges go by, getting many to wave back to her. Paris is a great city for kids! Jen on September 3, 2010 at 5:45 a.m. When I saw the Eiffel Tower in person for the first time, I was amazed at how little it appeared to be until you went up it. Your picture captures that feeling of how far in the air you actually are! Kristy on September 3, 2010 at 5:58 a.m.
Something about being up that high makes such an impact. Great shot and loving photo Friday! Amy @ The Q Family on September 3, 2010 at 6:08 a.m.
Love the shadow of the Eiffel Tower! Mara on September 3, 2010 at 7:16 a.m. When we were up in the Eiffel Tower, my children loved looking for all of the landmarks we had visited (we went on our last day of a two-week trip). It's definitely worth waiting in line to go up there! Marina K. Villatoro on September 3, 2010 at 8:28 a.m.
Amazing photo! I love shadow of the tower. Crystal @ Traveler's Barista on September 3, 2010 at 8:53 a.m.
Amazing view...I hope to someday see it as well! Paris is HIGH on my travel bucket list. Caitlin @ Roaming Tales on September 3, 2010 at 9:19 a.m.
How funny, mine is about a city view as well, only from the cable car across the harbour in Barcelona! George on September 3, 2010 at 4:54 p.m.
Amazing pictures! I love the height. It is my dream to Paris and going to top of the Eiffel Tour, to see the down. This is dream may be complete in next year. Thanks for sharing this post with us. Dominique on September 5, 2010 at 5:57 a.m. This photo really does capture how the Tower dominates the landscape! I love photos that picture a subject indirectly like this (I've been getting into taking pix of reflections lately). Anna Moffat on September 5, 2010 at 1:14 p.m.
Great photo! Paris was the first trip I went on with my husband (12 years ago!) and I'll definitely be going back there with our son some day. Mary on September 6, 2010 at 6:34 p.m.
Fiona on September 9, 2010 at 5:20 a.m. Cool! Eiffel Tower is my dream ever since I was a teenager. I think this place is a very romantic place for a couple to visit. Amazing photo! I would to take some photos when I get there.